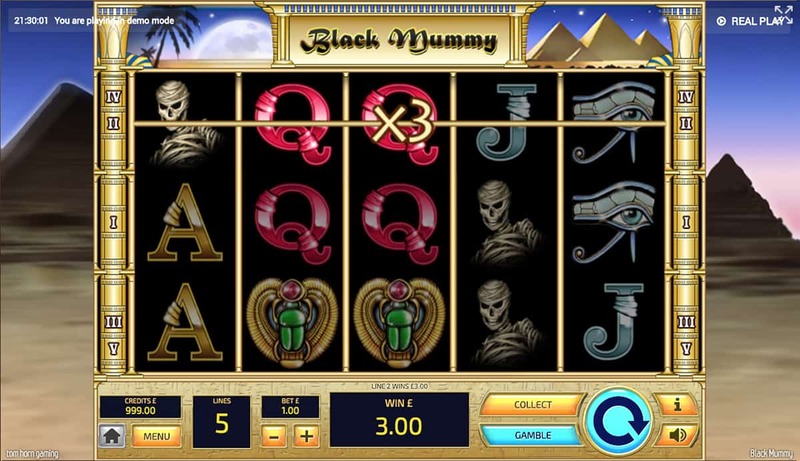 n Black Mummy Slot. Tom Horn give us a dynamic approach to ancient Egypt. On this five reel, five payline slot. We explore the mystery of The Black Mummy and find out just how lucrative an expired Pharaoh actually is. You don’t need to be an archaeologist to unearth hidden treasures of Egypt. When the quick and easy-to-play Black Mummy serves it up on a golden yet sandy platter. Black Mummy is a subtle take on ancient Egypt. It doesn’t scream Cleopatra or Sphinxes but nevertheless manages to fill up the whole screen in an ornate design. Two columns to the side display the paylines while a banner at the top shows the obligatory pyramids in the background. But the rest of the reelcase is like something we’d imagine in a Pharaoh’s palace (a classy Pharaoh, mind). A toned-down gold colour with menu and setting options clearly displayed at the bottom. Across the reels the symbols are impeccably designed. The Eye of Horus, Sarcophagus, Gold Ring and Scarab Beetle accompany the card values Jacks through Aces. The symbols all have a nice gleam to them, making this slot seem extra shiny. Though the shininess contrasts well with the menacing look of the Black Mummy symbol, as it gazes into our very soul. But that’s mainly because it’s got dark black eyes (or holes where its eyes should be!). But don’t worry, it’s not here to cause harm. 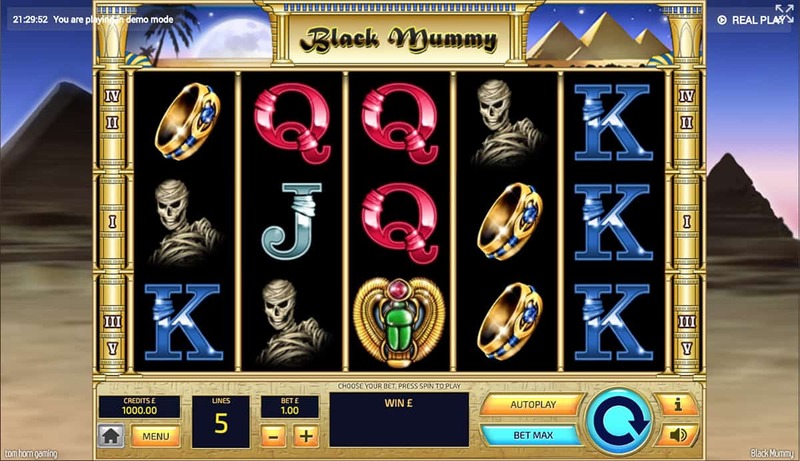 In fact, as the slot’s Wild, the Black Mummy is a most rewarding ally. 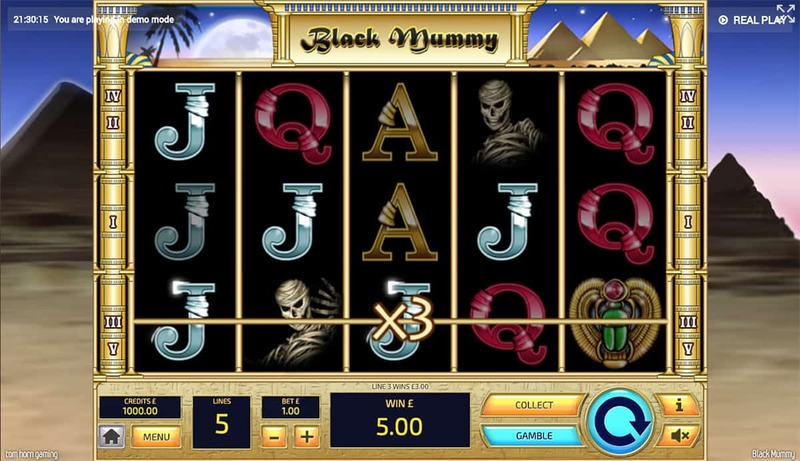 The Black Mummy is a dynamic slot to play as the payouts all vary depending on the size of the bet. The bet level is easily altered by clicking on the plus or minus buttons at the bottom of the screen. With only five reels and five paylines we find ourselves watching out for the winning combinations, but thanks to the Black Mummy Wild, these actually happen more frequently than we might initially think. As it’s stirred from its grave, the Black Mummy substitutes for all symbols, but alters the payout multipliers when substituting for the lower-paying Jack, Queen, King and Ace symbol. With up to x5 multiplier awarded for the lower-paying symbols and up to x50 multiplier for the highest-paying Sphinx, plus x100 for landing five Wild Mummies in a row, the Wild Mummy is our way to unlocking these spooky Egyptian treasures. This game also features a Gamble Feature, which appears after landing a win. Should we choose to, we’re presented with a box with five grey stars. We have to guess if the next star is black or red. If we guess correctly, we double our win and continue through the rest of the bonus round. If the star is golden then we win the round automatically. Are you brave enough? The Black Mummy is a fun game to quickly pick up and play. If you want to revisit ancient Egypt or prefer Mummies as your horror beast of choice then this slot will give you your fix. 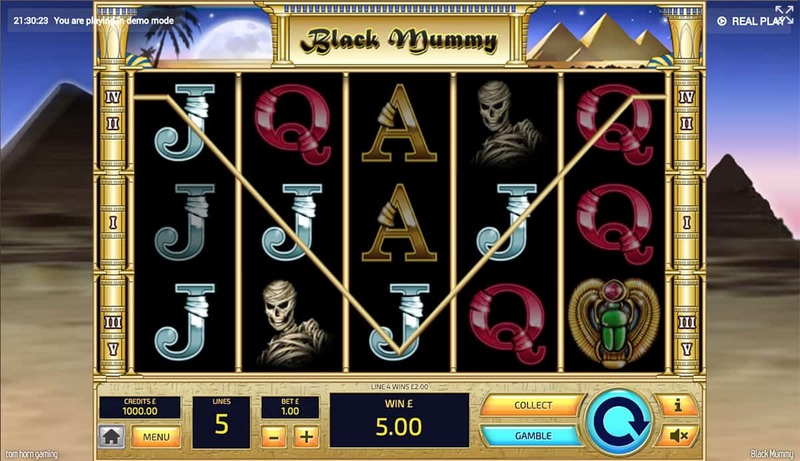 Although there are no free spins or added bonus features, the Wild Mummy multiplier is a decent substitute. And a handy little extra is that when you click on the symbol on the reels, we can see how much it will pay out, which makes it plenty easier than searching for the paytable. All in all, the Black Mummy is a great way to enjoy short and sweet spins and wins.